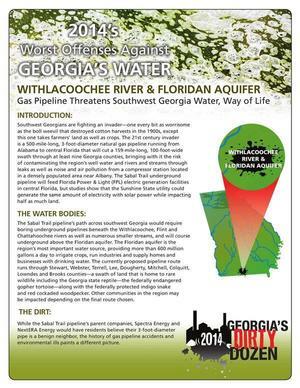 VALDOSTA — The Georgia Water Coalition has named the proposed Sabal Trail pipeline as one of its Dirty Dozen for 2014, which highlights “12 of the worst offenses to Georgia’s waters,” according to the organization. 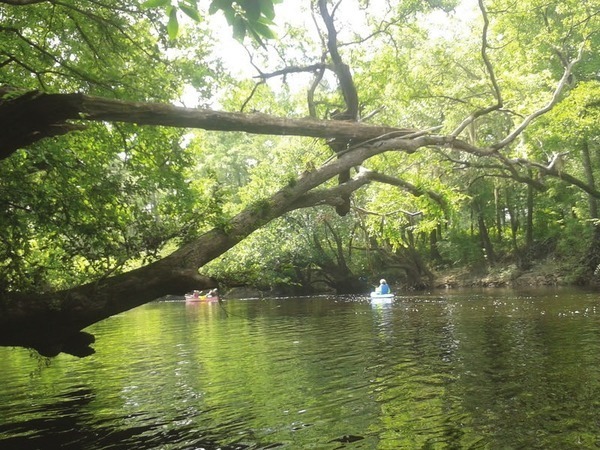 The pipeline is proposed to run under the Withlacoochee river, near Valdosta. In a press release, the GWC cited the risk of contaminating southwest Georgia’s well water, rivers and streams, as well as noise and air pollution from a proposed compressor station situated near Albany. The GWC also cited the possible dangers of the pipeline, citing two explosions in particular — a 2011 explosion in Alabama that torched 65 acres of forest, and a 1994 explosion on a Spectra Energy pipeline that ruined an apartment complex, leaving hundreds homeless. 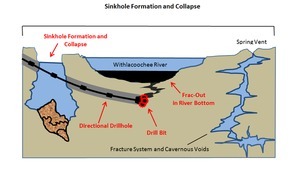 This entry was posted in Pipeline, SAVE, Sinkhole, VDT, Water, WWALS and tagged Albany, Clake Bark, Dougherty County, Georgia, Georgia Water Coalition, LAKE, Logan Hulsey, Lowndes Area Knowledge Exchange, Lowndes County, pipeline, Sabal Trail Transmission, SAVE, sinkhole, Students Against Violating the Environment, Valdosta, VDT, Water, Withlacoochee River, WWALS on October 23, 2014 by John S. Quarterman.